Inspired by the classic 13 Steps to Mentalism , Step #9 Mediumistic Stunts is Paul Voodini's very personal look at the world of seance and paranormal entertainment. This extensive manuscript looks at Ouija boards and glass moving, the use of pendulums, table-tipping, red light phenomena, the spirit conductive rope, and the black out seance. Although Paul has previously written extensively on the subject of seance and paranormal entertainment, this is all new text with Paul going into great detail on many aspects that he has never talked about before. 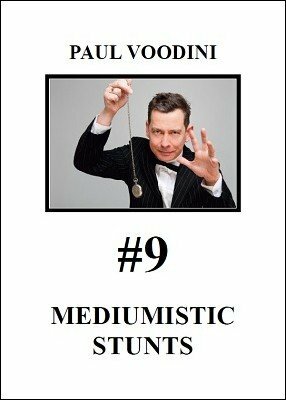 Whether you are an experienced seance host or whether you are new to this area of the magical arts, you will find much in Step #9 Mediumistic Stunts to excite, inform, and enthrall! None of the routines included involve any trickery in the general sense - rather the magic all takes place in the audience's minds and because of this is all the more potent and powerful! 1st edition 2014, 38 pages.